SAHA - South African History Archive - THE UNITY WE NEED IS PEOPLE'S UNITY : WE NEED IT ALL WE NEED IT HERE WE NEED IT NOW! : ORGANISE FIGHT ON! THE UNITY WE NEED IS PEOPLE'S UNITY : WE NEED IT ALL WE NEED IT HERE WE NEED IT NOW! 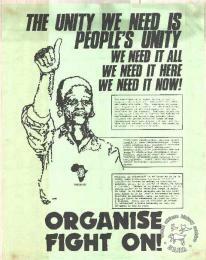 : ORGANISE FIGHT ON! Title: THE UNITY WE NEED IS PEOPLE'S UNITY : WE NEED IT ALL WE NEED IT HERE WE NEED IT NOW! : ORGANISE FIGHT ON! Rights: Copyright of some materials are held by individual postermakers/organisations. Copyright restrictions may apply. See SAHA copyright statement for more information. Please share your views or anecdotes, particularly if you were present or affected by the events described in this poster, photograph or document. Your comment will appear on the website as soon as it is approved by a moderator.